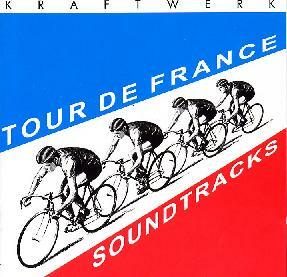 Kraftwerk - "Tour de France Soundtracks"
To be honest, this is my first Kraftwerk CD to listen to after their overwhelming debut record when I was about 14 years old. And again, more than thirty years later, they’re dealing with speed, movement, directionality. And they do this in a very decent and sophisticated way. Well, regarded as the inventors of Techno they can play with this genre. If anybody else, they have the right to do so - and to show the direction where electronic Pop might go: 1. Pop music needs a frame of reference. 2. Pop music needs a dancey foundation. 3. Only tasteful Pop music is really sucessful Pop music. 4. Music needs melodies - but don’t overdo it: when it’s shrewed one bar is the right length of a Pop melody. 5. Pop music needs vocals - if you can’t sing, just talk or take vocal samples. 6. Originality is relative - you can put together the best known ingredients, if you do this in an ingenious way it works. 7. A successful Pop CD needs a hit or at least one tune with strong hit potential and a high value of recognition. 8. Don’t mess with your audience - entertaining music can be demanding music as well. This is Kraftwerk’s "musicology" I extracted from their latest release, but this might as well have been the blueprint or masterplan behind this record. And you might even add: 9. You’re always better off with a good theory. In the case of "Tour de France Soundtracks" it’s the theory of deconstructivsm - well known in the humanites during the Eighties of the last century - and starting off from France like the famous bicycle race mentioned in the title. So, all your senses are taken on a musical bike ride and what you get is described in the list above: The Tour de France is the reference of the whole record, you can dance along, if you like, you might be delighted by the stylish melodies, the friendly robotic voices, the way the patchwork of sounds works, and at least one track that is simply beautiful in the sense that it was intended to sound beautiful. In opposition to most industry releases I’ve been listening to during the past months it’s really worthwhile to listen to this CD more than once, you can detect several levels of possible perceptions and investigate the construction principles of the music - if you like. Altogether this CD is an invitation to have an active position as a listener - once in your head, it’s your music and you can use it as a sonic construction kit - constructing, re-constructing, de-constructing and even reflecting theories of Pop while listening or invent your own theories... and you can do this while dancing about. You want more details about the musical content - ? No, sorry, a review about a murder mystery won’t tell you who’s dunnit as well. On the surface you get technoid repetitive structures together with seducing melodies throughout the whole album. If for you this is enough to know to be abhorred by a record, leave it. If not, you can detect an essential record, whatever your other musical preferences may be. You can visit Kraftwerk’s website at http://www.kraftwerk.com.